This article is the first in a new series where I will be looking at actors who are best known for starring in genre series and films. In order to qualify for this series, an actors most famous roles have to largely have been in cult things. For instance Richard Attenborough though appearing in one of the most iconic genre and cult films, Jurassic Park, wouldn’t really qualify as a cult actor as his career consisted of mostly mainstream film and television series. Tom Baker on the other hand would be not simply because he played the Doctor, but also because many of his other most famous roles were in horror movies, or classic British comedies like Blackadder, The Golden Voyage of Sinbad etc. This series will try and look at a wide range of actors from various different backgrounds. From big Hollywood stars, to voice actors, to stars of classic, cheap British Sci Fi series. The first cult actor I will be looking at is Michael Wisher. Now Wisher is known primarily for his roles in one genre series “Doctor Who”. His roles in this series were mostly small, but he nevertheless managed to endear himself to genre fans forever with his performance as the deranged and evil creator of the Daleks, Davros. Wisher to me seems like the perfect choice to start, as he never really became that big a name even to genre fans. Still he nevertheless managed to give some of the most iconic performances on the history of television. So without further delay lets take a look at the career and genre roles of Michael Wisher. Michael Wisher was born on the 19th May in 1935. He had many roles on television including in “Dixon of Dock Green”, “Z Cars” and the genre series “Moonbase 3”. He also had an extensive theatre career too and was a very in demand actor until his death in 1995. However it would for his work in “Doctor Who” that he would be most remembered. Wishers first on screen credited role. Prior to this adventure he had provided a small voice over for the second Doctor story “The Space Pirates”. There is not really much to say about this performance. Wisher doesn’t get a lot to do he is on screen for all of two minutes and is basically wasted in the role. Still this does mark his official Doctor Who debut none the less. Wisher’s first prominent Who role was as the villain Rex Farrell in “Terror of the Autons” Rex was the Master played by Roger Delgado’s sidekick. He didn’t have a lot to do in the story with arguably his biggest role being taking the Masters place when UNIT try and shoot down the Master. Still Wisher made the most of this character and he and Delgado play off of one another quite well. Farrell is not really a villain as the entire time he is mind controlled by the Master. His death therefore is actually one of the more tragic moments of the story. He joins the sadly long list of people the Doctor failed to save from the Master. The character of Kalik served as the main villain in the Robert Holmes classic “Carnival of Monsters”. He was a somewhat more comical villain however, as he is ultimately killed by the very plan he hopes to use the overthrow his brother. Still Wisher brings the character to life in a very memorable way, managing to capture the humorous elements of the character such as his snobbishness and prissiness, as well as his darker qualities such as the opening scene where he casually guns down a dissident worker in cold blood. Michael Wisher voiced the Doctors greatest enemies in four stories. “Frontier in Space”, “The Planet of the Daleks”, “Death to the Daleks” and “Genesis of the Daleks” though he also voiced them in episodes of “blue peter” and the 30th anniversary documentary “More than 30 years in the TARDIS”. 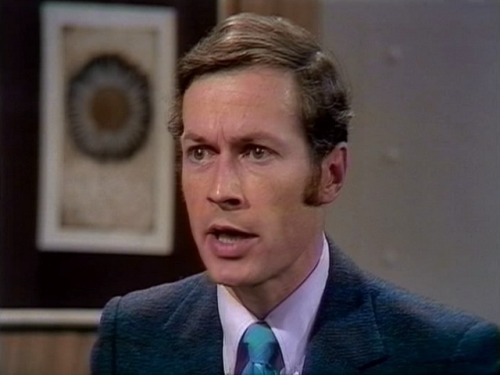 Wisher was the 6th actor to play the monsters and though not quite as menacing as Peter Hawkins, Roy Skelton or later Nicholas Briggs, I still think Michael’s Dalek voices were quite effective in their own way. Nicholas Briggs the current voice of the Daleks, a close personal friend of Michael Wisher has said that the dying Dalek was always one of Wishers favourite moments and he would enjoy acting it out for fans. I think Wisher has had an influence on Brigg’s portrayal of the Daleks to an extent. Briggs I think is probably the best Dalek voice artist for me as he is able to combine the aspects of all the previous Dalek voice actors together. In a new Who Dalek story you will typically see one Dalek who is the leader who will have more of a Peter Hawkins vibe to his voice, then there will be the lowly grunt who will have more of a David Graham quality, then there will the soldier who is desperate to kill everything that moves and is fanatical even by Dalek standards and he will be the Roy Skelton Dalek. Finally there is the scared, hysterical Dalek who is in a constant state of panic and can’t stand anything going wrong at all, he is the Michael Wisher Dalek. This was Wishers greatest performance and indeed one of the greatest performances of anyone in Doctor Who. Its up their with the best performance of any actor in the role of the Doctor. The fact that Wisher had experience providing Dalek voices I think helped him find the right balance in Davros’s voice. At times when he was hysterical such as when is demanding the Doctor tell him the reason for every Dalek defeat, Davros can sound almost like one of his creations, but it was never too much however and indeed some of the most chilling moments of Michaels performance are when Davros speaks in a more calm, quiet voice such as when he talks of experimenting on Gharman’s brain. Davros in “Genesis of the Daleks” is a much more fleshed out character than he is in later stories thanks to both Terry Nations strong script and Wisher’s performance. Wisher is able to bring so many different sides to the villains character. On the surface Davros is the ultimate Who monster. He is evil incarnate, a man who commits double genocide on the Thals and his own people the Kaleds, who casually murders hundreds of innocent scientists and who is revealed to have delusions of tearing down all of creation itself. The famous phial scene where the Doctor asks Davros if he would use a virus capable of destroying all life, to which Davros responds that that power would set him “up above the gods” and that through his creations the Daleks “I shall HAVE THAT POWER!” is arguably the defining moment of Davros’s character. Prior to this Davros had attempted to present himself as someone who was just desperate to see his race survive. As his race are destined to mutate into frail creatures, he believes he needs to make any sacrifice to ensure that these creatures can go on and programs them to be aggressive because he believes that is the only way they can survive due to their vulnerability. He also at one point tries to justify the Daleks need to conquer by claiming that one race needs to rule the others, as the master race can help the other races by showing them how to better themselves. He even claims that under the Daleks rule wars and persecution will end, and that they will rule benevolently. “Evil? no I will not accept that when the Daleks have suppressed all other life forms, when they are the masters, then you will have peace, they are not a force for evil, but for good”. The Doctor however see’s through this and exposes Davros’s true character by asking the phial question. Davors’ excitement at the Doctors hypothetical idea of ending all live, reveals that all he wishes to do is destroy, because it gives a weak pathetic little man like him a perverse sense of satisfaction. The creation of the Daleks is really all just to do with Davros’s own personal glory no matter how hard he tries to dress it up in being for the future of the Kaleds, or even the sake of the universe itself. This is further evidenced when he says to the disloyal Kaled Scientists “We, I WILL GO ON” The fact that Davros creates the Daleks almost in his own twisted image also reinforces this. Some men just want to watch the world, nay the universe burn! However despite this Wisher is incredibly enough able to inject some sympathy into Davros’s character too. The final scene where the Daleks turn on Davros is actually my favourite moment in the entire history of “Doctor Who”. Davros finds himself ironically begging the Daleks to show pity on his loyal Kaled Scientists. The Daleks however can’t as they don’t know what pity is literally, as Davros removed it from them. Here even Davros realizes what a monster he has created. Before he had looked on pity as a weakness that had to be removed, but now he see’s that a creature without pity is truly uncontrollable and that even he, as ruthless and cruel as he is, is still capable of some acts of compassion whilst the Daleks simply are not. One can’t help but feel almost sorry for him as he attempts to place his withered hand on the Daleks self destruct button finally realizing how wrong he has been and how all the sacrifices have been for nothing, only to be gunned down by his own creations who don’t show any emotion as they kill him. They don’t even view it as a triumph of killing their creator. To them killing Davros is no different to killing a Thal grunt. Davros was truly the height of Wisher’s career, not just in Doctor Who, but overall. He never again sadly got to play a role as large as this, but fortunately Davros was enough for him to always be remembered. “Genesis of the Daleks” has gone down as one of the all time greatest Doctor Who stories and is in fact the most repeated Classic Who story of all time. Davros meanwhile has also gone down as one of the most iconic Who villains of all time as well. He would return many times (in every Dalek story in Classic Who in fact from this point on.) Sadly however Wisher would never get a chance to reprise his role. The producers did approach Wisher for both “Destiny of the Daleks” and “Resurrection of the Daleks” but he was unavailable both times. He did get to reprise the role on stage however in the play “The Trial of Davros” where he got to act alongside Peter Miles who had played Nyder in Genesis. Still despite only playing the role of Davros once, most Whovians still regard him as the best Davros and indeed Tom Baker himself has said that he considers Michael Wishers Davros to have been the best villain his Doctor encountered. Wisher’s performance as Davros had to rely entirely on his voice much like many other who villains from that era such as Gabriel Woof’s Sutekh and Michael Spice’s Morbius. He even practised with a paper bag over his head. It says a lot about Wisher and these other actors such as Gabriel Woof that they were able to create such memorable villains through their voices alone. Wisher’s next Who role was in “Revenge of the Cybermen”. 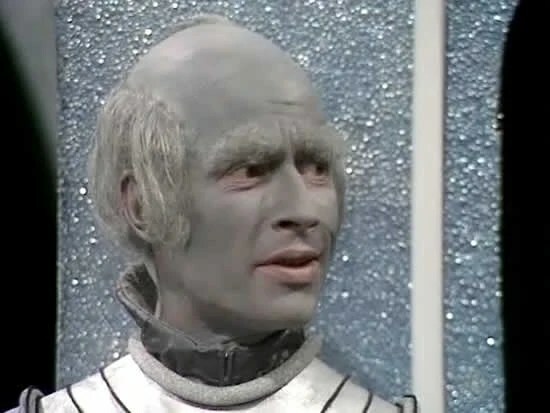 Sadly the role was not that great a one, with Wisher’s character being a mere sidekick to the main villain of the story aside from the Cybermen themselves, Vorus. There’s not much to say about this character though Wisher is as good as ever. Its worth noting that this was not Wisher’s only role in the story. He also played a Vogan who is shot dead at the start and also provided an uncredited voice over. This story was actually shot before “Genesis of the Daleks” though it aired afterwards so these roles actually technically predated his performance as Davros. Wisher’s final Doctor Who role sadly was another minor character. On the plus side its arguably his most elaborate, over the top death, but still its a very small thankless role. Its a shame that after his success as Davros he never got another major Who role. I would have thought considering the success of Genesis, that Hinchcliff and Holmes at least would have had plenty of more characters for him.